We have an old Long 360 with the front end loader. Problem is the bucket / controls donot seem to want to work very well. The bucket goes up very slowly, the controls have to be turned, pulled, pushed "JUST" right for this to happen. Any ideas how to fix this and get the power needed to use the bucket to move dirt etc? are the controls joy stick??? and have you checked the fluid level???? Looks like we missed one and Digger didn't get a timely response. Good thing Loghouse noticed it. Maybe Digger still visits and we can help with his problem. I'd start out by asking if the 3ph works normally. The controls are joy stick type. The fluid level is normal. The hydraulic systems is not working at all now. The entire ysytems has been drained, compressed air blown through. The filter on the bottom right side has been removed, cleaned, blowned out and dryed then put back in. There are new hoses, new fresh fluid. Lines were bleed. My best guess is the pump is shot. Have I missed anything, or any little trick? If it is the pump does anyone know where I can get one? when you say"the entire hydraulic system is not working" does this also mean your draft control will not function?? Sounds like Log may know the tractor. I'll have to be told if it has a draft or position control hitch and if the hydraulics is an open or closed system type. You might look to see if the pump has a port for priming it or else try to fill it through the suction line just in case it's a priming problem. One other thing I'd check before writing off the pump is the relief valve. Some pumps do require priming. 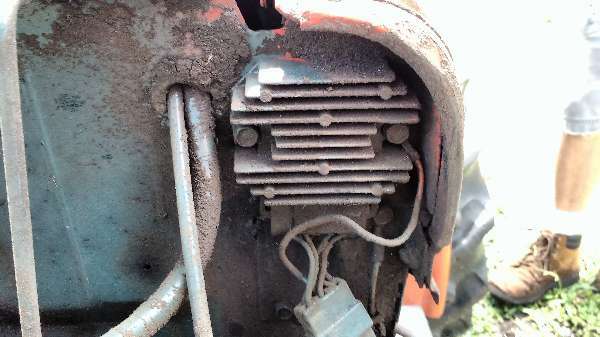 I don't know exactly how to describe where a relief valve might be might be on the tractor. Some have them in manifold blocks, others have them in the 3ph or loader valve or both or all three places. A relief valve is a plunger held shut by a spring. A broken spring or stuck plunger could cause the problem. If the problem came on abruptly, you might check for a sheared pump drive shaft key or other broken part. The bad news is that if the problem came on slowly it may be a seriously worn pump and many gear type pumps aren't actually rebuildable. The web link below goes to a site that seems to sell two different pumps for Longs. I found it in a web search for 'long tractor' and know nothing else about the company. The same search didn't come up with any dealers. There is a discussion about Long Agribusiness in the archives that can be found be searching for 'long' in the subject. It's more about the company than parts though. There are some general ways to pressure test pumps that might be useful and perhaps more later. Don't want to sound dumb, but I don't know what the draft control is. I do not have a manual, purchased tractor from an old farmer and this is my fist one of this size. I have completely empited and "blown" out all the lines, cleaned the filter, put in new fluid, bled the lines, replaced some of the lines. I'm not even sure if the lines were attached right in the first place. Controls are joy sticks on the right hand side of the tractor up by the seat and the fluid is on the nose. The controls are sloppy but they did kinda work when I first got it. I don't know what 3ph is, unless you are asking about the pto, and it is working. "I'd start out by asking if the 3ph works normally." I feel really dumb, I don't know the answer to your question "I'll have to be told if it has a draft or position control hitch and if the hydraulics is an open or closed system type." How can I tell? Also, i have not up graded my membership yet and I can not see the entire relys yet.